I just watched the last of the five classic titles Disney released blu-ray, Mickey Donald Goofy: Three Musketeers 10th Anniversary Edition . The other four titles were Tarzan, Hercules, Adventures of Ichabod & Mr Toad / Fun & Fancy Free, and Bedknobs and Broomsticks. Not only had I never seen this movie before, but I don't recall ever even hearing about it. I'm not a huge Micky Mouse and Donald Duck fan but I tried to go into it with an open mind and actually found it to be better than I expected. The story goes that Mickey, Donald, and Goofy dream of being Musketeers, but Donald is too cowardly, Goofy is too dumb, and Micky is too short. Their big break comes, however, when the princess demands bodyguards and the evil Captain Pete doesn't want to assign skilled bodyguards because he intends to have the princess kidnapped so that he can become king. Thus, he makes Micky, Donald, and Goofy into Musketeers and assigns them to guard the princess. Captain Pete has no doubt that the trio won't be able to stop his plan, but he's in for quite a surprise! There were some funny visual gags here, but most of it didn't really work on two levels as something like Shrek does. This is mainly a show for kids, and in that respect it works. It's only about an hour which is perfect. The film looks nice and clean, and the animation is smooth and pleasant. You can tell this isn't	a classic Mickey cartoon as it just looks too good, but it still feels like it with the characters retaining their personalities. For extra features, there are deleted scenes with audio commentaries, a behind the scenes featurette, a kind of fake behind the scenes thing, a lame boy band music video, song selections which plays the songs from the movie, and then some games which, lets be real, has there ever been a truly enjoyable game on a DVD? So not bad on the extras, but nothing really great either. And that about sums up the movie too, it's not bad but nothing really great. 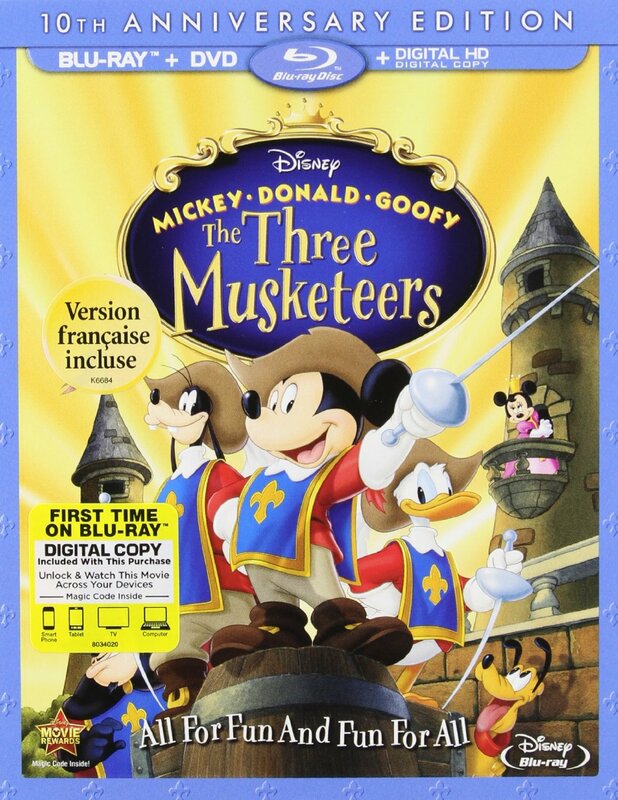 Mickey Donald Goofy: Three Musketeers 10th Anniversary Edition (Blu-ray + DVD + Digital HD) , released by Walt Disney Video, is available starting August 12, 2014.